I woke up to the sun pouring in through the window. Confused, I thought I missed my alarm. When I looked at my watch I found it was 4:40 am. Man, the sun rises early in Maine. Gordon and I rolled out of our bunks at the AT Lodge, strolled down the street to the AT Cafe and had the thru-hiker special for breakfast. I would highly recommend the SOBO special with the AT lodge. 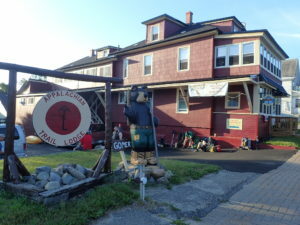 For $70 you will get picked up from the bus stop in Medway, a ride to their lodge, one night stay, breakfast in the morning and a ride to Baxter State Park. 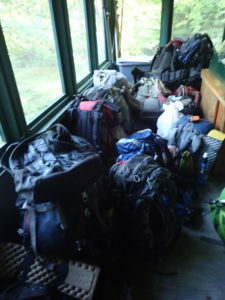 Also, they offer a resupply in the wilderness for $35 (which we took advantage of). The shuttle ride into BSP felt like a rafting trip talk. It was pretty interesting. We got dropped off at the Ranger station by 7:30 am. We traded our fully loaded packs for a day pack. We met another southbounder, Brian, and flip-floppers, Guru, Wallace, and Inchworm, all who needed a place to camp that night. We had reserved a spot and agreed to let them stay with us. 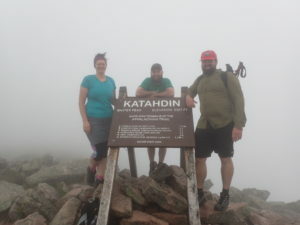 We left the Ranger station to start our summit of MT Katahdin. The trail started as a nice gradual climb through the woods up to a waterfall. Soon the boulders started to get mixed in. As we climbed, there was less and less dirt, and more rocks. After a while we reached a large boulder (taller than me) with a metal pull-up bar sticking out of it. It was the moment of no turning back. For the next 2-3 hours we started to climb boulders. 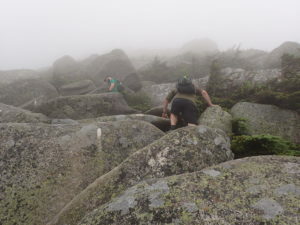 The clouds had rolled in, so there was no way of seeing past the boulder you were climbing. We had no idea how far we had come, or how far we had to go. 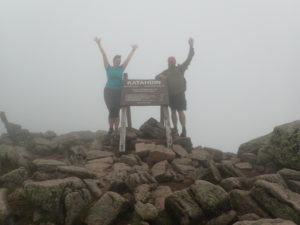 We finally reached the Table Land, and more clods rolled in, and the wind started to pick up. 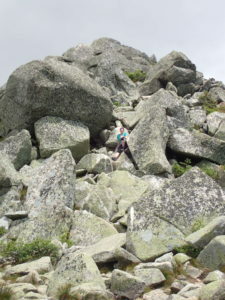 We cruised across the plateau, climbed over on last rock scramble, and reached the summit. It was cold, windy and wet at the top, so after a quick snack we headed back down the trail. 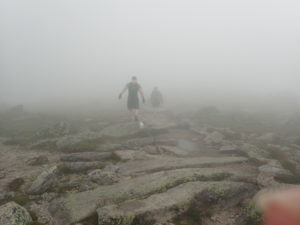 There were many sketchy moments going down, but the clouds would blow out from time to time to allow us to see the views we had missed on the way up. Down and down we climbed. When we finally reached camp, we were so exhausted we could barely get the energy to set up camp and eat dinner. We woke up early, had our breakfast and said good-bye to our flip-flop friends (who all 3 together go by Bears to Men). They planned on a 25 mile day, which was not in our cards. We planned to hike with our new friend Brian for a few days, as it seemed we would be traveling about the same pace and distance. The terrain was fairly flat, so it made for a fast hiking day. We hoked out of BSP and made a quick stop at Abol Bridge. Brian said the Guthook app was saying they had food and beer, so we figured we would stop for our bite of real food and a beer before we entered into the 100 mile wilderness. Surprisingly, we ran into our friends, Bears to Men, who were finishing a meal and about to head out. 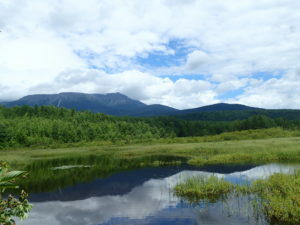 At sometime we passed a body of water, showing a great view of the mountain. We reached Hurd Brook Lean-to at a reasonable time. We set ourselves up in the shelter, then rinsed off in the brook before heading to bed. I made up my own beat-box: roots and rocks, and roots and rocks, and roots and rocks. 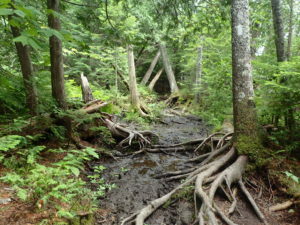 Swampy and full of roots and rocks. We ran into a trail crew working and placing large rocks in the swamp as stepping stones. It was really great to see this younger crew working together and sharing tips to get the large stones moved around. We passed by Rainbow Lake and enjoyed the sounds of the Loons. 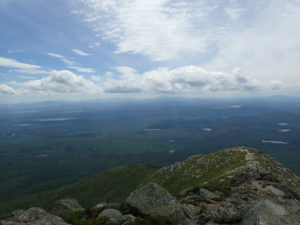 After a good climb, we were rewarded with a great view of Katahdin. The time flew by and we reached Rainbow Stream Lean-to early. Again, we had a great area to sit in the stream to cool off, and rinse the sweat of our bodies.